Volume 1 contains 4 DVDs with Episodes 1-17 with English subtitles. Directed by Chandraprakash Dwivedi and Produced by Chinmaya Mission. What is Upanishad Ganga : Vedas are the most ancient scriptures and are the very source of the Wisdom of India. Upanishads are the philosophical essence of the entire Vedic teaching. 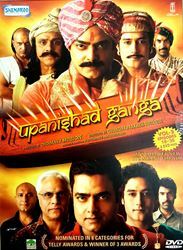 The Upanishad Ganga is a television serial in Hindi of 52 episodes depicting in an audio--visual format the essence of the Upanishadic teaching as well as the hoary cultural, intellectual, and knowledge traditions of India. Through this serial the entre Vedic culture is also presented. Various stories from the Vedas, Upanishads, Puranas, and Indian cultural history have been used as vehicles for bringing home the concepts in an interesting and appealing fashion.\r\n\r\nA Unique Project\r\n\r\nIn each one of us there is SOMEONE who is constantly struggling to:\r\n\r\n Express himself fully\r\n\r\n Break all bandages\r\n\r\n Find the purpose and meaning of life, and\r\n\r\n Search the Truth behind this world.\r\n\r\nMan is in search of answers to fundamental questions like:\r\n\r\n Who am I?\r\n\r\n What is the goal of life?\r\n\r\n What is this world?\r\n\r\n How to go beyond sorrow?\r\n\r\n How to lead a life of fulfillment?\r\n\r\nThe Upanishad Ganga deals with these issues. It is NOT about any historical or mythological character. Upanishad Ganga is unique for it is a serial depicting the story of YOU & ME.\r\n\r\nThe Indian Spiritual Wisdom has come down to us in its value and content. Just as the holy Ganga flows down from the heights of the Himalayas, this Knowledge or Jnana Ganga too flows from time immemorial to benefit all, irrespective of caste, creed, colour and nationality. Upanishad Ganga brings out the practical applicability of this knowledge in transforming the life of the individual and the society at large. Since, television has become an important medium of communication for family audiences and youth in particular, the wisdom of the Upanishadic teachings and the evergreen cultural values in the Upanishad Ganga are sought to be presented through television. This is the first time that such a mammoth and challenging production is being undertaken by any organization or individual.\r\n\r\nConcept Development\r\n\r\nThe Vedic Culture is introduced in the initial episodes (1-4). Then cultural values at the levels of the individual and the society are presented in the following 18 episodes (5-22). After Thus establishing the cultural basis and ethos, the entire Upanishadic Wisdom is then presented in the next 20 episodes (23--42). The practical steps that could be taken to actualize this wisdom in one's life are then elaborated in the next nine episodes (43--51). The last episode is An expression of gratefulness for this Wisdom which has made India proud, noble, and admired the world over.